The Case Types report draws from the referral source indicated in the case record. This report can be copied and pasted into a Word document, in an Excel document, or into an email. This report draws its information from the first Case Type indicated in a Case Record. This report can also be displayed in a pie chart. 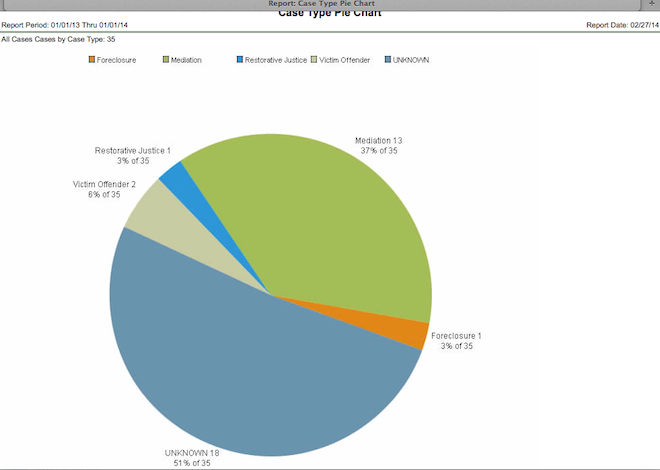 1) To use your Case Types Report, please click SETTINGS> and then select one of the Case Types options in the list. A new window will pop open showing you your report options. Select a Start and End Date and decide if you want to include Closed, New, or All Cases within that time frame. 2) A new window will open either showing you your report or your pie chart, depending on which option you selected. Copyright 2019 Resourceful Internet Solutions, Inc. All rights reserved.